This unusual poster is from 1927. 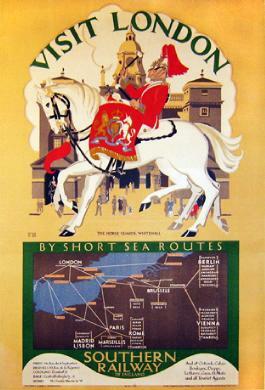 It encourages visits to London via short sea routes from a range of continental origins as wide as Moscow and 'Stamboul' (Istanbul). The upper illustration is described as 'The Horse Guards, Whitehall'. The artist was 'F.B.'. Now, who was that?